It’s time to fuse the tower defense game and collectible card game into one game, Defenders 2 APK 1.5.144034. A very innovative game, it takes the tower defense game to the next level. As a part of Prime World series, Defenders 2 is a powerful sequel to an already well-known game, and you will feel the massive differences compared to the previous game. Take control of the tower defense to uncover the secret treasure guarded by hordes of monsters, all while standing at the top among the masters of the tower defense leaders. Four different game modes, such as the Hunt, Assault, Raid, and Hard mode, will challenge your skills as the tower defender. This famous game will strike your Android device and bring the intense struggles to your device. The unique and innovative gameplay of Defenders 2 is the main departure from the old game. With over 40 towers to protect and over 20 spells to use, the customization of your skills will be even more perfect than before. The powerful enemies are here, and they’re various, such as the Phantom, Swarming, Intelligent, Underground, Phantom, and the other 20 kinds of monsters. The challenge is topped with powerful and unique bosses. Defenders 2 will offer you endless customization to your runes and tower defense mechanism, and the fun doesn’t stop there. Once you’re done with the main story, you can challenge various enemies to your liking—even your friends. Connect to the internet and challenge your friends to further perfect the collection of yours and strengthen your tower defense. For more challenge, Defenders 2 gives you the customized weathers in-game, giving you more challenge as you struggle in the ever-changing battlefield. As the ultimate tower defense game, it is a must taste the wonderful challenges of Defenders 2 for Android. Play the game the way you like – find the unique combination of tower and magic arsenal to build the superior defense! 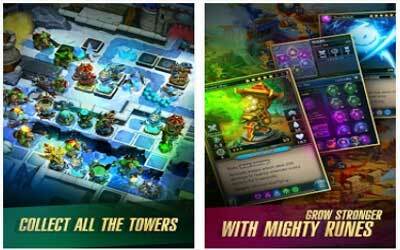 Different TD game modes – Hunt, Raid and Assault levels and the rule-them-all Hard mode for truly tower defense fans! Increased damage and efficiency of many towers and magic cards. Decreased difficulty of Ghosts and Golems in the first battles against it. Viewing the video will no longer cause the game crash. Fixed an issue when in some cases players can not see their Help Desk tickets. Fixed a bug due to which the game would not run on devices with Android 6. Fixed UI errors and text errors.